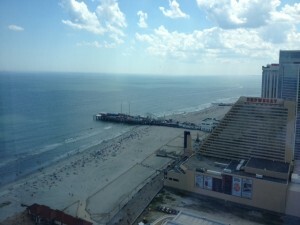 The Revel Atlantic City and Maryland Live! casinos began taking bets from eager and optimistic gamers in recent months, and friends and I have tried our luck at both. Where we’ll continue to play is up for debate. Can’t beat the view from the Revel. They’re vastly different projects—Revel is a $2.4 billion world-class resort on the A.C. boardwalk, Maryland Live! cost $500 million and sits next door to Arundel Mills Mall in Hanover—but they’re linked by their competition for Mid-Atlantic game-players, like me and my blackjack-loving friends. In Atlantic City, casino operators are looking to Revel’s Las Vegas design and atmosphere to boost the area’s slumping gaming revenue. Even with Revel opening in April, gambling winnings for A.C.’s 12 casinos in May dropped 10 percent to $263 million from the same month last year, according to New Jersey’s Division of Gaming Enforcement. May’s slump followed a 10 percent drop in April and a 5 percent slip in March, in part because gamblers from neighboring states have new casino options closer to home. Maryland Live! is the state’s third casino, as the state hopes slot machines and other electronic games boost state revenues and support education funding. Hollywood Casino Perryville, in Cecil County, opened in September 2010, and the Casino at Ocean Downs, near Ocean City, opened in 2011. Those two casinos have generated a total of $227.6 million in gaming revenue since they opened, with more than $110 million going to the State’s Education Trust Fund, according to the Maryland Lottery. Maryland Live! expects to generate at least $400 million for the state per year. Last weekend, a few college roommates, both from New York, and I decided to meet in Atlantic City for a mini reunion and a Revel review. The place is simply massive and outshines the nicest casino Atlantic City has to offer, the Borgata. Revel sits at the top of the boardwalk, just north of the Showboat. The outdoor pool was packed on a Saturday afternoon, as were several other deck areas with ocean views. Inside, the 130,000-square-foot casino was busy, but not overflowing with people, in the early evening; there was no wait to throw some chips down at a $15-minimum-bet blackjack table. The dealers are nice, the free drinks are served in glasses, and—this is big—the entire casino is smoke-free. So even if you lose next month’s cable bill, you won’t also have to spend that much on dry cleaning. 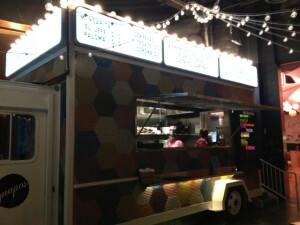 Revel had several high-class dining options, but we opted for the in-house taco truck, called Guapos. I had the chicken, one friend went with pork, the other had shrimp and chorizo—we gave thumbs up to all three, and it was a solid $15 to $20 dinner. Construction crews were still working on some areas of the resort — a four-story indoor club called HQ Nightclub and the HQ Beach Club on the ocean are set to open later this summer — so we didn’t get the full Revel experience. But it absolutely felt like Las Vegas on the Jersey Shore. With a small blackjack win — about $60 after a full night of playing — in my pocket, I’ll make the trip down the A.C. Expressway to Revel again. Baltimore’s Cordish Co., however, wants gamblers to abandon a three-hour drive to Atlantic City and game closer to home, after June’s opening of Maryland Live! The casino opened with 3,200 slot machines and electronic versions of classic table games such as blackjack and roulette. An additional 1,550 machines will be added by October. Two Maryland friends and I headed to Hanover on a Thursday night to check the new place out. Parking was easy and free, and though the casino was packed (as it has been since it opened), it wasn’t difficult to move around the floor or grab a bite and some drinks at the now-open Cheesecake Factory or Chef Bobby Flay’s Burger Palace. Phillips Seafood and another food court were other food options, and The Prime Rib is scheduled to open in October. Cordish is also planning to open a Ram’s Head Center Stage live entertainment venue last this year. My friends found two seats at the electronic roulette game, and they even had some early luck. Each player sits with his or her own touch-screen roulette game, betting on favorite numbers, with a real automated roulette wheel in the center of the seats and screens. It was a very comfortable setting, and servers stopped by often. One difference between Maryland and Atlantic City—when playing in Maryland, drinks aren’t on the house, they’re full price. If only they had more than slots. The best compliment we could pay Maryland Live! was that we didn’t feel like we were within steps of a shopping mall; it was as nice, if not nicer, than most Atlantic City casinos. We left Maryland Live! impressed and likely to return. The issue, however, remains that local players looking for legit blackjack and roulette, with real cards and human dealers, will have to wait a little longer in Maryland. Cordish and other state casino operators continue to lobby legislators to approve table games to boost revenue; it appears that change is inevitable, but when that happens is anyone’s guess. From one player’s perspective, when Maryland Live! is fully-built and table games are in place, it will be an easy decision for local players to bet on a Saturday night in Hanover over a long weekend in Atlantic City. As long as, you know, you’re OK with a view of a mall parking lot instead of the Atlantic Ocean.